YOUNG, Donald Edwin, a Representative from Alaska; born in Meridian, Sutter County, Calif., June 9, 1933; A.A., Yuba Junior College, Marysville, Calif., 1952; B.A., California State University, Chico, Calif., 1958; United States Army, 1955-1957; teacher; Mayor of Fort Yukon, Alaska, 1960-1968; riverboat captain, 1968-1972; member of the Fort Yukon, Alaska, city council, 1960-1968; member of the Alaska state house of representatives, 1966-1970; member of the Alaska state senate, 1970-1973; delegate, Alaska state Republican conventions, 1964, 1966, 1968, and 1972; elected as a Republican to the Ninety-third Congress, by special election, to fill the vacancy caused by the death of United States Representative Nick Begich, and reelected to the twenty-three succeeding Congresses (March 6, 1973-present); chair, Committee on Resources (One Hundred Fourth through One Hundred Sixth Congresses); chair, Committee on Transportation and Infrastructure (One Hundred Seventh through One Hundred Ninth Congresses). Videoreels, Videocassettes, and Sound Tape Reel: 1980-1990, 6 commercials on 2 videoreels, 26 commercials on 5 videocassettes, and 6 commercials on 1 sound tape reel. 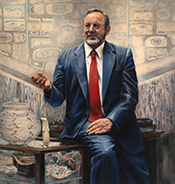 The commericals were used during Donald Edwin Young's campaigns for the 1980, 1984, 1986, 1988 and 1990 U.S. congressional elections in Alaska, Republican Party. Kriz, Margaret. "Out of the Wilderness. "National Journal 27 (April 9, 1995): 864-69.